Ohio summers, in their own way, are as brutal as Ohio winters, with high temperatures and higher humidity levels turning our homes into ovens for months at a time. Your air conditioner will be put to use on a daily basis, and if it’s not up for the challenge, you could be looking at a sudden breakdown just when you need the system working the most. Now is the time to check the status of your A/C. That way, if there are problems in need of repair—or if your system’s race has been run and you need a new system installed—you can do so before the temperatures get too high. 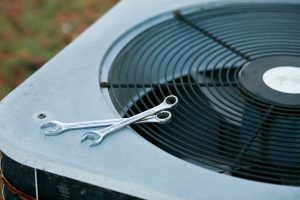 The first and most obvious step for handling your air conditioner is to schedule spring maintenance with a trained technician. Ideally, you should schedule such maintenance once a year or even twice depending on the age of the unit. Maintenance session isn’t the same as a repair. It is more of a tune-up, allowing the technician to check for big problems as well as correcting the little ones (like loose bolts and dirty filters) that don’t merit a repair call on their own. This gives the technician a chance to check for potential repair jobs that may be necessary, as well as helping the system perform more effectively and lowering the monthly cost of running the system. Assuming that maintenance checks are good, you can likely rest easy knowing that the AC is ready for the summer. But what happens if repairs are needed? Some of that depends on the cost of the repairs and the overall age of the air conditioner. If the system’s warranty is still in effect, repairs are probably the best option. If it has expired, however, then consider whether the cost of the repair job is worth more than the system itself. You might also consider replacement if this is your third repair job (or more) in the last twelve months. If you don’t want to invest in a new system (either because money is tight or your existing system is still doing all right for itself), but you would like the system to perform more effectively, you should think about the installation of an upgrade: an inclusion into your existing system that improves its performance as well as offering added features in some cases. The obvious example is a smart thermometer, which provides greater choices for helping you make the best use of your HVAC system. But it can also include things like a dehumidifier to lower the moisture content of the air (reducing strain on your air conditioner), or an electronic air filter that can spare you having to change the existing filters in your system. Specifics vary by home, so make sure you consult with a professional service to determine the best kind of upgrades for you. For air conditioning maintenance, repair and replacement in Westlake, OH, call Westland Heating & Air Conditioning today.